Comments: Although similar to Western Grebes, Clark’s Grebes in breeding plumage can be distinguished by orange bills and dark caps that do not extend to the eye. In wintering plumage both birds are similar, although bill color may still reliably be used to differentiate them. Clark’s Grebes are less common in the northern and eastern Great Plains than Western Grebes. Western and Clark’s grebes were once considered to be the same species. 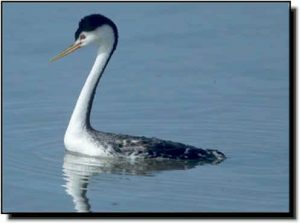 However, differences in vocalizations and appearance and a tendency to forage in deeper water than Western Grebes have led to classification as different species.